Need a quick and simple keto dinner in no time? 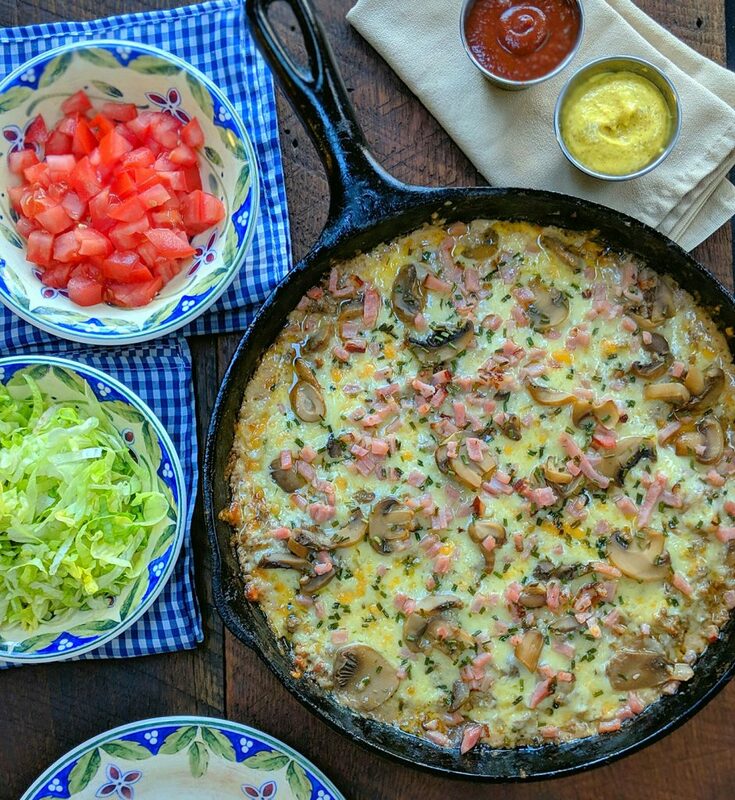 This one skillet cast iron recipe will be a staple in any low carb kitchen. ditch the bun and eat with a knife and fork like an adult or at least fake it like I do. Who grew up with that little talking white glove dancing around on your kitchen counter claiming to make you dinner a breeze by just adding ground beef. I was very fortunate to have parents who cooked on a regular basis but we would turn to the helpful dancing glove from time to time and I have to admit those meals were delightful. Later on in college I practically lived off of boxed dinners and cup of noodles until I started cooking as a profession. This recipe takes me back to a simpler time with a one pan meal that takes about 20 minutes to make start to finish. 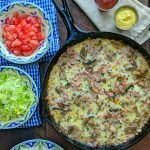 There’s countless recipes on the ingredients for different hamburger casserole so I figured I’d throw my hat in the ring and share my ketofied take on one of my childhood favorites. 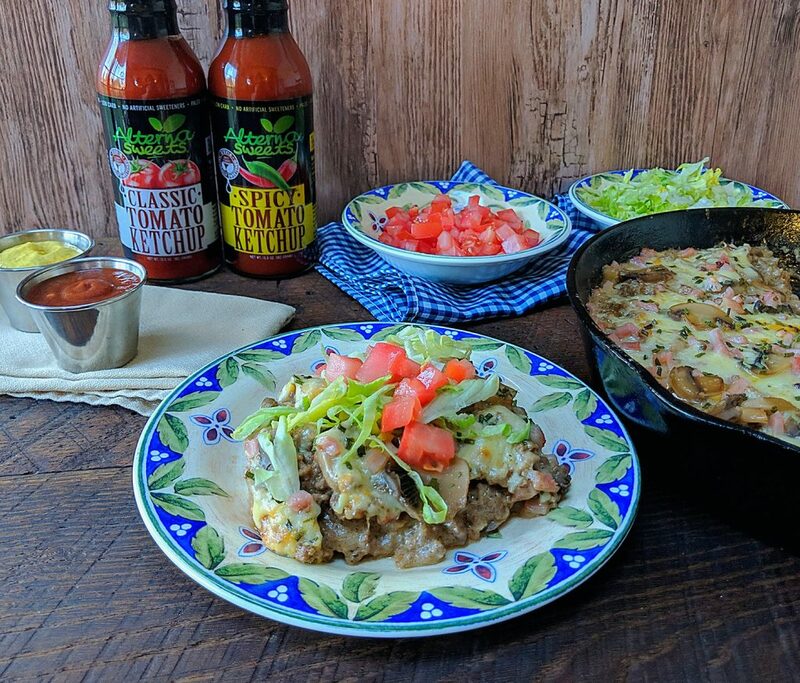 As I said before there’s a million recipes for hamburger casseroles so if you don’t like a specific ingredient or cheese just swap it out to your liking. This recipe was partially inspired by a cordon bleu sandwich with mushrooms, ham and Swiss. 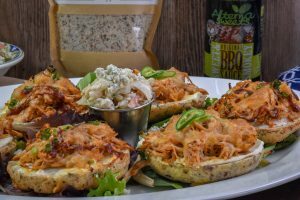 You could go with a bbq cheddar bacon version as well that would be outstanding, or maybe a Cajun, bacon, bleu cheese, bayou style. The possibilities are only limited by your creativity. One little addition I like to do is serving the casserole with a selection of condiments on the side, in this case I just kept it simple with some lettuce, tomato, mustard and spicy ketchup. Go ahead and serve any condiments you enjoy on a burger alongside the casserole so everyone can customize their own dinner. In a 12” Skillet add 1 tablespoon butter and diced onion. Over medium heat stir the onions until they soften then add ¾ of ham and mushrooms. Save the rest for garnishing on top. Next add the seasoning, mustard, ketchup and Worcestershire. Continue stirring. Add ground beef stirring until fully cooked. Fold in cream cheese and mix until totally melted then turn heat to low. Stir in half of the Swiss cheese until mixture is smooth. Top mixture with remaining cheese, ham, mushrooms and chives. Serve with additional mustard and ketchup along with shredded lettuce and tomato.